(Via Barrett-Jackson media) SCOTTSDALE, Ariz. – Oct. 26, 2017 – Barrett-Jackson will auction a 2017 Ford GT that was generously donated by businessman Ron Pratte to the Evernham Family-Racing for a Reason Foundation, during the Scottsdale Auction, Jan. 13-21, 2018. The Evernham Family-Racing for a Reason Foundation will sell the supercar during the auction, with proceeds benefiting the Autism Society of North Carolina’s IGNITE program, which offers activities, skills training and educational workshops that address the social, financial, educational and employment needs of young adults with high-functioning autism or Asperger’s Syndrome. This will be the first current-generation Ford GT that has been donated for charity since the car was introduced. Ford is also including a Ford Performance Racing School GT Experience that will be included in the auction of the Ford GT. This world-class program will give the winning bidder the chance to improve their driving skills behind the wheel of one of the world’s most celebrated supercars, while also supporting individuals with autism. One of the few 2017 model year Ford GTs built to date, this extremely rare liquid-blue supercar was delivered earlier in the year to Mr. Pratte. 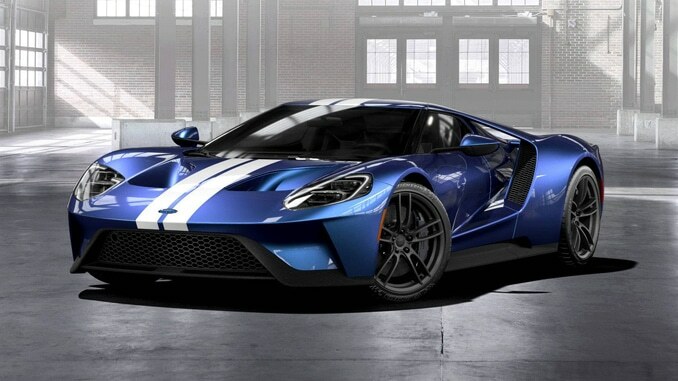 Ford’s all-new supercar is designed and optimized for track performance to honor its racing heritage. The Ford GT couples its extraordinary power with impressive aerodynamic efficiency and advanced active dynamics to achieve a maximum speed of 216 mph – making it the fastest Ford production vehicle on the track ever. IGNITE is operated by the Autism Society of North Carolina with founding support from the Evernham Family-Racing for a Reason Foundation, a 501(c)(3) organization by legendary NASCAR crew chief Ray Evernham. More than half a million individuals with autism in the U.S. will reach adulthood this decade and lose support as they transition from high school. IGNITE addresses this need, focusing on the strengths of its members and providing them with the tools and support to achieve their goals and dreams. Over the past decade, several historic Ford vehicles have been auctioned with Barrett-Jackson to support charity, including a 2007 Ford Shelby GT500, 2017 Ford Raptor, Ford Focus RS and 2016 Ford Shelby GT350. Working together, Ford and Barrett-Jackson’s auction of this 2017 Ford GT will add to the millions of dollars that have already been raised by both companies for non-profit organizations nationwide.